Southwest Florida’s humidity creates a perfect home for the spirited bat plant, also known as Tacca chantrieri. Its hauntingly beautiful blooms prefer shade, well-drained, fertile soil and a warm environment (no direct sunlight) to stand a ghost of a chance for survival, but it’s worth it to persist. 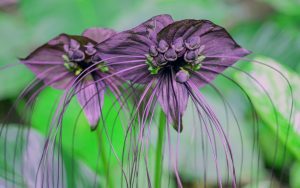 You’ll be rewarded with a flower like no other: black with long “sinister” tentacles worthy of any Hollywood horror movie you can think of. Native to West Africa and Southeast Asia, bat plants can grow as tall as three feet with the right conditions, with bat-like blossoms up to a foot in width. Their long-lasting blooms appear for up to seven weeks once the plant reaches 2 to 3 years old. Find a protected area for your bat plant that receives indirect light for at least four hours a day to promote the best blooms, and water it when the soil is just barely moist. No wet feet for these bats, please (that would cause a horrible death). If they wilt no worries. The leaves will spring back quickly with water. Cover these frost-tender plants with a bucket when the temps are forecast to drop below 55 degrees or take it inside (if it’s in a container) and place it in the bathroom overnight with humidity from a hot shower to keep it happy. Bat plants aren’t too spooked by pests; however, they are a bit fussy about their growing conditions to perform their best. Never fear: They’re a bewitching and unique choice for a massed shady ground cover and are certain to become a conversation piece in your Southwest Florida landscape. 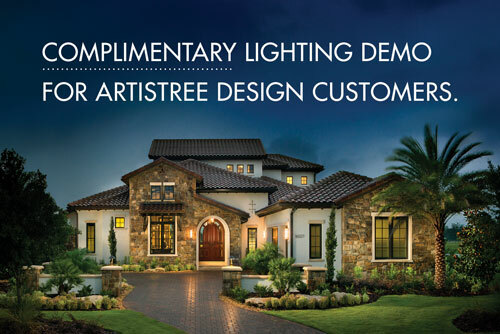 If you’d like to add this spellbinding treat to your landscape, call the award-winning designers at ArtisTree Landscape Maintenance & Design at 941.488.8897. They’ll be happy to scare up a landscape design for your home. Rex and his crew completed the scheduled plantings and did a great job as they always do. He takes the ball from you and runs with it. Our community deserves the best and that’s what we get. Thank you! LANDSCAPING INCREASES VALUE BY HOW MUCH?